There are certain things that we all read on the Web that we find unbelievable. Not "unbelievable" as in "amazing," but events that simply cannot be believed. Some of these crazy things have actually occurred as reported, but many are simply hoaxes. Thank God for websites like Snopes.com to debunk these myths. Last week, my hoax detector was going off at full speed when I read on Yahoo! News that a stray dog was condemned to death, or stoned, by a rabbinical court in Jerusalem. The report in Yahoo! News was reprinted from the Israeli newspaper Maariv which reported that a stray dog wandered into a Beit Din (religious court) in the strictly Orthodox neighborhood of Mea Shearim in Jerusalem and refused to be moved. A judge on the Beit Din determined the dog was a reincarnation of a secular lawyer who died 20 years ago. 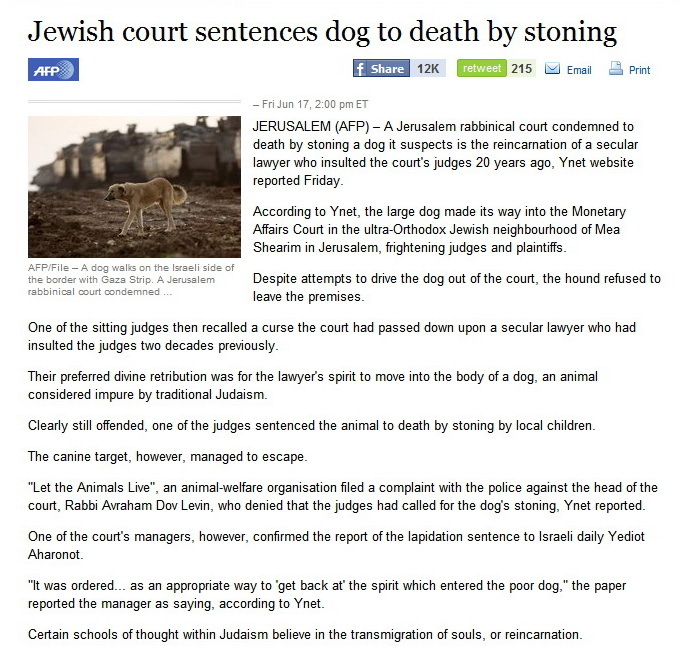 The article claimed that the judges on the Beit Din then "decreed" that local children stone the dog to death. Once the story hit Yahoo! News it got picked up by the BBC where it was the most read story of the day. Of course none of this actually happened. It was a joke. That's right, a joke. However, with news items traveling the globe at lightning speed thanks to the Internet, this story was everywhere within an hour. The damage was done even though Maariv issued a correction and apology on its website, JTA released an article explaining that there was no stoning of a dog, and Yahoo! News took the story down. It was already re-posted on hundreds of websites around the world. There is no basis for stoning dogs or any other animal in the Jewish religion, not since the days of the Temple or Abraham... The female dog found a seat in the corner of the court. And the children were delighted by it; there were hundreds outside the court. They are used to seeing stray cats but most have never seen a dog before. The only action we took was to dial the number of the Jerusalem Municipality to get the people in charge to take it away. There was no talk of reincarnation, a lawyer has never been mentioned, either now or 20 years ago, and there was no stoning. Such inventions are a kind of blood libel, and we wonder why the inventor of the story did not continue to describe how we collected the blood of the dog to make our matzah. The story, when circulated on Yahoo! News, attracted more than 1,800 comments, most expressing violent anger. Just another example of people believing the truly unbelievable on the Web. Maybe it's time for the large news agencies to actually fact check before publishing on the Web. I too heard this no to believe, simply ridiculous story, and of course did not believe it, however, there are people who would believe anything especially if it fits their agenda. I liked the response of the Beit Din. I'm STILL getting questions about this on my blog and Facebook page, as well as emails from angry animal rights people -- thanks for a good comprehensive rebuttal I can now link to. Isn't someone confusing Islamic courts with Jewish rabbinical ones? 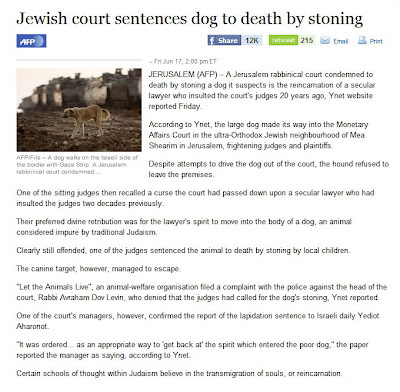 As everyone knows, a rabbinical court would NOT condemn an animal to death by stoning. They would simply lecture and nag the beast into a state of moral paralysis.